If you have decided to try the latest beading craze, French Wire Beaded Flowers, the Bead Spinner is the tool for you. 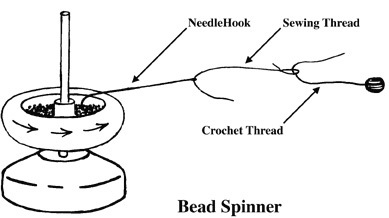 All you do is pour your beads into the Bead Spinner dish, bend the wire you wish to string your beads on, so the end resembles a hook, and your ready to go. Just set your wire (with the end now fashioned into a hook) on the surface of your beads and spin the rod. It's just that easy. If later you decide you want the needle-hooks for Bead Crochet, Bead Knitting, or any other form of bead work you can purchase them separate at any time. Needle-hooks are $6.00 each.